A series of poetic plays by Ruth Krauss (1901-1993) demonstrating the possibilities of selection and juxtaposition. This was the final production of the Word Players. The Word Players are: David Haight, Susan Miller, Sherry Pockell, Ann Rivers, Julie Scherer and Edgar Walker. Directed by Baird Searles, with technical production by David Rapkin. "There's a little ambiguity..." is published by Something Else Press and was used with the author's permission. 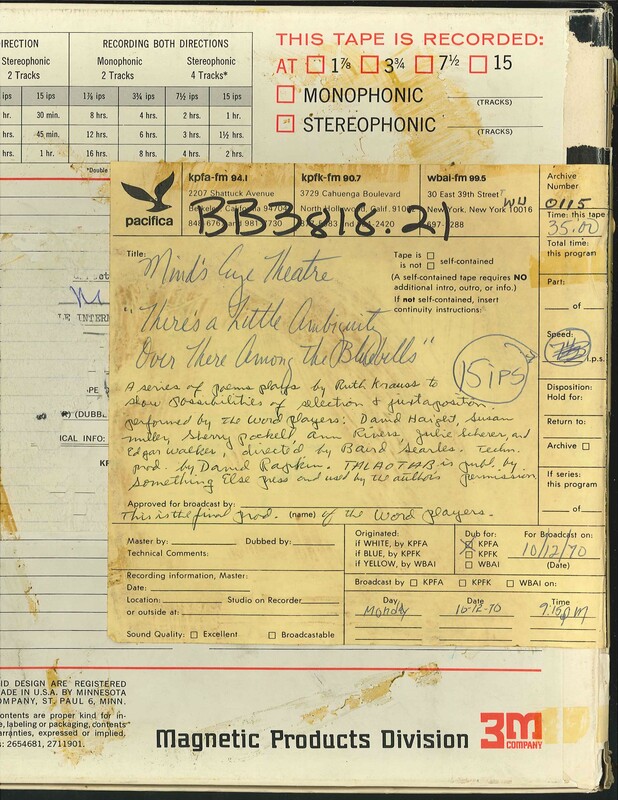 This recording was formerly cataloged as BB3818.21. WBAI, 12 Oct. 1970. First WBAI broadcast, 1970-05-23. 1 reel (35 min.) : 15 ips, mono.